Even more user-friendly layout, information on all of the products, practical CAD download: FIPA GmbH has completely redesigned its website, which now offers many useful extras. 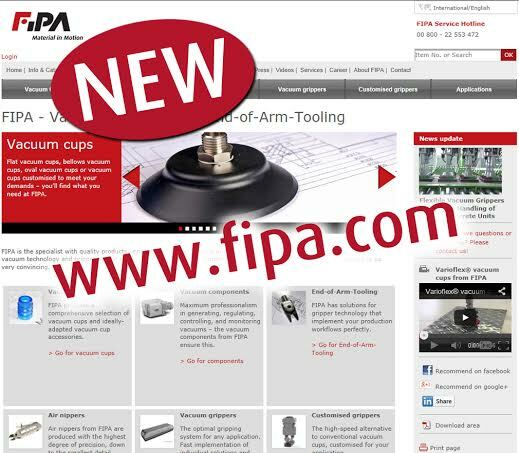 The FIPA products and all their relevant technical data can now be viewed online. “The system of categorization according to products and line-of-business applications, combined with the optimized search function, enable automation specialists and materialflow experts to find suitable products within a very short time. Functions such as the quotation list and the option to redirect the shopping cart both support the request for quotations,” Rainer Mehrer, CEO of FIPA, tells us. 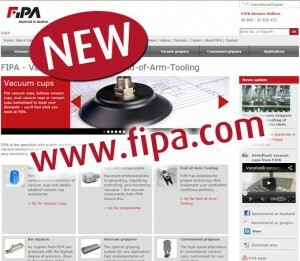 Find the right product even quicker: With this aim in mind, FIPA has completely redesigned its website http://www.fipa.com. With just a few navigation steps the interested party is directed to the product he is looking for. The system of categorization according to product groups and subgroups was taken over from the catalogs, thereby doing away with the timeconsuming task of having to learn a new method. On each product page you will find a photo, a product description, technical data, dimensions, diagrams and accessories. The interested party can generate a datasheet for each product. You can even access CAD data after registering once. The new shopping cart function brings a great deal of added value to medium-sized and large companies in particular. As soon as a technician finds a suitable product, he places it in the shopping cart and redirects this using the e-mail function to his competent buyer. The buyer then has all of the automated data necessary for requesting a quotation. This rules out errors such as transposed digits or erroneous item descriptions during the ordering process. There is no need for any time-consuming copying or reentering of the data by the buyer. Categorized as in the catalogs: The navigation is oriented towards the familiar system of categorizing the catalogs according to product groups. Users can find their way around immediately. Convenient shopping cart function: Technicians select products, and buyers request these specific products.This allocation of tasks, which is particularly common in large firms, is supported by the new shopping cart function. This means that customers can save themselves unnecessary work and typing errors are avoided. Flexible search: The search function supports the search for item numbers and specific terms. A special search function limits the search by setting specified parameters. Recommendation by mouse click: If a user finds an interesting product, he can redirect the relevant information automatically to his colleagues. Obtaining quotations: Each product page offers the opportunity to request a quotation: After entering the required number of items, the request can be forwarded directly to FIPA by mouse click. Downloading CAD data after registration: Users can download CAD data of the products free of charge. This simplifies the integration of FIPA products into packaged solutions. All current FIPA catalogs can be downloaded in PDF format. If required, an interested party can also request the printed catalog. Application reports, which can be called up under the menu item “line-of business applications”, offer valuable information on how vacuum cups, air nippers and other FIPA products can be applied.